According to the experiences of specialist urology and sexology offices which participated in the research and creation of the product, BeDynamic capsules have shown very satisfactory effect with complete absence of side effects. BeDynamic capsules have a unique impact on sexual drive in women. Apart from that, they positively affect the potency of a man. 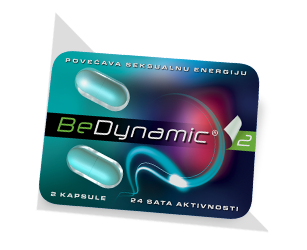 BeDynamic capsules enhance sexual desire and improve the overall sexual function in both men and women. Besides, they also have a positive effect on a whole-day improvement of mental and physical capabilities. It is recommended to take one BeDynamic capsule 30-60 minutes before the activity. BeDynamic capsule can be taken orally or you can open it and pour its contents into your favorite drink. Maximum effect is within several hours from intake, but its effects last much longer. BeDynamic capsules are placed in a very practical "takeaway" package so that they are available to be used immediately, without the need to unwrap them, which is suitable to the needs that most men and women have stated when it comes to this kind of product. Look for the product in your pharmacies or order here.